Iwamura (岩村) is a Edo Style town located south of Kiso River in Gifu. Iwamura was used to be a castle town. 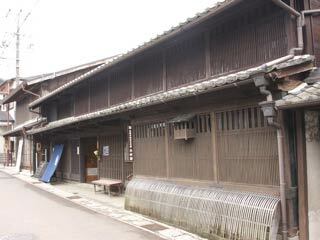 Today, it has still many remaining houses since Edo period which gives travelers the look of Edo style town. Those remaining houses are now opened as the museum. At the end of the town, there is a mountain castle called Iwamura castle. This castle is not only the major tourist attraction in Iwamura, it is also chosen as one of the three major mountain castles in Japan. There is parking. At the tourist organization center, you can get a map of Iwamura. The main street from the castle to the station is well preserved its look of Edo Style town. When you walk around this street, you will see many trace of Daimyo Parade such as the shrine, samura windows and Koshi windows. Also, you can check some of the remaining houses since Edo period which gives you the life and house structure of Edo period. Iwamura was the biggest castle town in eastern Mino, and those remaining houses were the powerful merchants houses. Kimura House, built in late 18th century. Tosaya House, built in 1780. Katsukawa House, built in late Edo era.